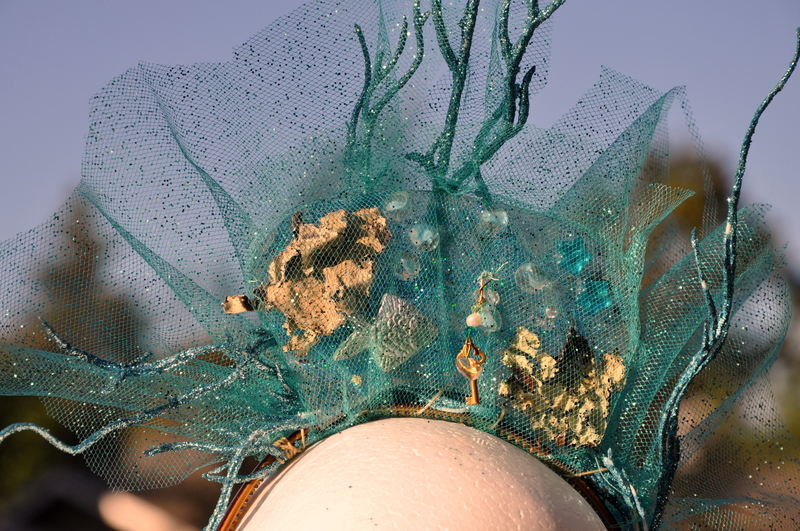 My under the sea costume headdress is almost done. I finished it yesterday, but it wouldn’t stay upright on my head. I slept on it (the problem, not the headdress) and once again the answer became clear. Instead of using an elasticized headband, I need one that grips the hair and sits upright. 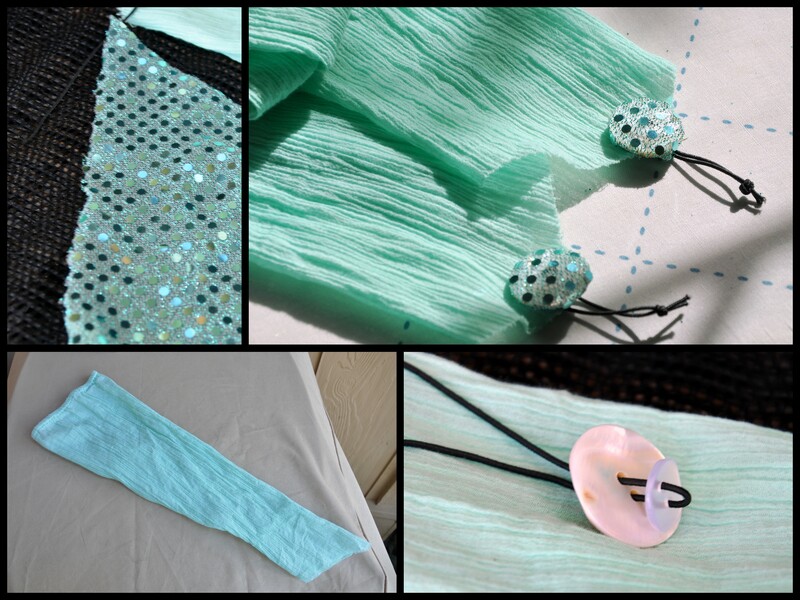 I’ll probably cut the elastic off of the band I’m using, and then resew the entire piece on to another headband. Does that make sense? Scrap of packaging plastic, festooned with glitter, beads and moss. 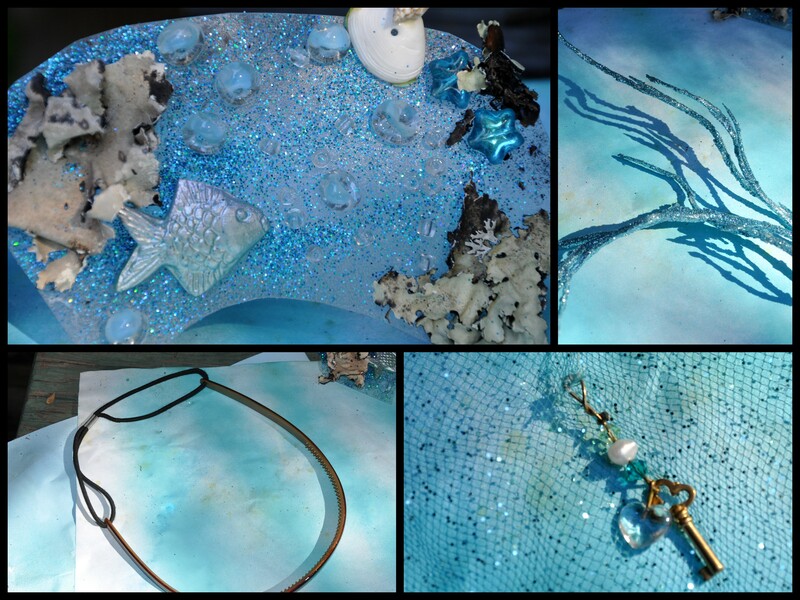 Sparkle branches, elasticized headband and the secret garden key with a glass heart, once attached to a very special gift. I started small, then added layers,careful to keep the piece light in weight. Using a piece of plastic from a disposable container, I cut a half-moon shape following the curve of my head. I spritzed it with glue, then added bits of moss, leftover beads from Mike’s helmet, a plastic fish from an earring and lots of sparkle. Once the plastic was dry, I encased it in a pocket of tulle, sewing the edges together after wrapping it around the headband. I added a snippet of blue sparkled branches along the band’s curve. It still needed some volume, so I added more tulle, gathered into a fan shape and sewn to the back. One more piece of glitter branch, also sewn on the back gave it more height. With glitter in my hair, on my face, and down the front of my jeans, I declared the head-piece sufficiently blinged! Using the sleeves of a thrifted gauze shirt, I made a pair of arm covers to emulate gloves. After fitting them to my arms, I added a piece of elastic to keep them in place over my ring fingers. I made a shank style button, joining two buttons together with elastic, then covering them with a scrap of glitter material left over from the top half of the dress. My son announced that they just ‘look like sleeves and not gloves’ taking the wind right out of my sails. He didn’t mean to be unkind, just passing on his honest opinion. I’ll try them on with the dress this weekend, and if they work well together I’ll use them. Instead of giving out candy this year, I’ve decided to give little bags of pretzels. Pauline suggested bookmarks to go with them, another great idea. I have about nine more days till the wee ghosts and goblins grace my doorstep, so once the costume is a wrap, I’ll come up with a bookmark prototype. This will be another fun way to promote the Little Free Library. Still candy free. Sad news on the pumpkin front. Like me, their once firm flesh is now soft and wrinkled. I fear one over-zealous costume change may put them out of business for good. A visit to a pumpkin patch is probably in order. Mike will need a bigger canvas for carving next week. For now, I give you Ghoulish Pumpkin. Dark! Dark! The horror of darkness, like a shroud wraps me and bears me on through mist and cloud. 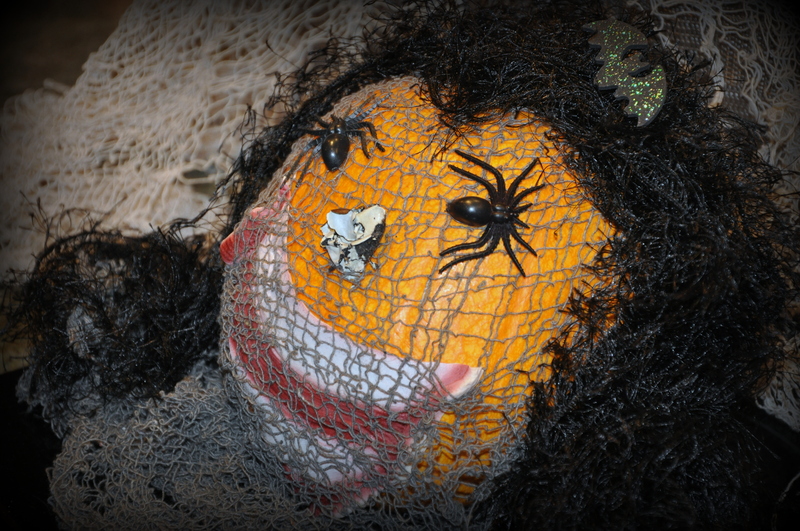 This entry was posted in Halloween and tagged Aqua, big pumpkins, costumes, DIY costume, DIY costumes, DIY Headdress, Halloween, pumpkins, Sea Headdress, Sewing, under the sea costume. Bookmark the permalink. Thanks, Cathy. I will do the full reveal next week. Dark, dark indeed. That pumpkin would scare the witches away. Your costume though, will delight all that swim by. Looks like a dry Halloween for all though. Your creativity is amazing. Hope we get to see the whole effect soon. I’m chomping at the bit to get a peek. Awwww…We’re attending the under the sea party in a few hours, and I have the blue fingernails and ‘big hair’ to go along with my blueness. I think I’m aging in reverse, Marlene. Come November my life will be a bit quieter. If you would like to Skype, please let me know. I have no idea how to Skype. I’m not sure you could understand me when I speak. That’s why I write. I won’t be back till Dec. I’ll check with my son on how to set up a Skype account and let you know. They signed a sale contract Thursday. Congratulations on your son’s sale. That must be a relief. No worries on the Skype. We can chat via Google or Facebook and I can ‘talk’ you through a few WordPress tips. Safe travels and best of luck with everything. Thank you, Anne. The first party is tomorrow so I had to plan ahead. I’m glad I did, because it gave me time to redo a few things that didn’t work out, and time to fuss with the headpiece. I’ve had so much fun making these costumes, and much of it because I could share it here. Will you go to 'our' pumpkin patch for an upgrade? I saw a few special pumpkins at the market the other day. Whitish green with lumpy boils and a similar orange one. But they were too expensive. I had picked out a pumpkin with a great giant stem. But it's broken off now, and the pumpkin is soft inside. Gads, I hope it lasts. Even random Facebook quizzes have us pegged, don’t they? I like it! Thank you for all your kind and supportive words, and for always taking the time to write such delicious comments. It means the world to me. It was nice being around theater folks. Like you, I’m not much of a sports fan and never really ‘got’ football. But once I stopped working in theater it could often feel isolating. So I completely understand where you are coming from. I would like to go to our pumpkin patch, but now I’m not sure if we can swing it. We’re actually expecting rain tomorrow and tomorrow night is the first party. Sunday, Mike is going to Oakland to see our niece compete in crew. Then we’re into the five day, Halloween countdown. I can hardly believe it. Wish you were here. The mystery crop pumpkins are so hard that I feel if you dropped on it would just roll thud to the ground before rolling away. The three I’ve been dressing up have gone soft, too. This Lou Who wishes to be with you since I miss you too ❤ Your niece is competing in 'crew'? I don't know what that is hon, is it a collage thing? Well I best run off and find my Workel, which is like a snorkel in Who-ville except the tube is all curly like a popcorn twist. I want to be able to hang under the sea with you on the weekend and us mere mortals, sans the Goddess status, need one 😀 mwaaaa! I miss you too, Lou. It makes me blue. Thank goodness for Skype, Blogging, Messaging and Facebook. I hope your weekend is going okay so far. She’s the second youngest of the five cousins. M is the youngest at 14, she’s 16, C is 17, A is 18 and the oldest almost 21. Were you able to find your Workel? I’m so sorry about the squishy pumpkins. They clearly can’t keep up with your zest for Halloween, Alys. The headdress is stunning and I wouldn’t take the comment about the gloves too seriously…..he hasn’t seen the costume in total yet. We are going to be in Fullerton for Halloween this year and because it is still so warm, I need to redo Robert’ s costume. He decided in July to be the Lion King….great, I thought to myself, we will use the gold hooded sweatshirt and sweatpants from last year’ s Winnie-the-Pooh costume, add a mane and head out the door. …….but it’s too hot and Robert will melt…..I’m thinking a turtle neck as the base and add yarn to a watch cap? ????? I’m stumped. We also need a pumpkin or two. Time to go shopping. That made me smile, Mary Elizabeth. I wonder since I harvested them a tad early thanks to the squash bugs if that made the difference? One year we had an un-carved pumpkin last nine months. You are sweet to throw in your support toward the gloves. It is true, too, that they’ll look more interesting when it is all pulled together. Have you moved to Fullerton completely or still back and forth? I would hate to think I missed a chance to give you a hug before you go. As for Robert’s costume, perhaps you can find a t-shirt in the same colors so he’s not so hot How cute that he wants to dress as the Lion King. I hope photos will follow.